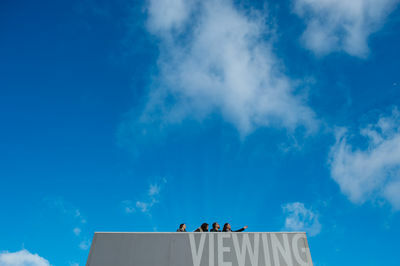 Still photography selection from various assignments and projects. Audio-Slideshow: Wacken in Germany is one of the most important Heavy Metal Festivals in the world with more than 70.000 visitors. 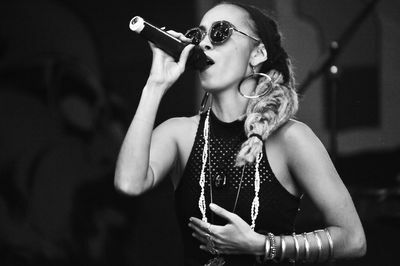 Top Act Nattali Rize (Australia) performes at the Reggae Jam Festival in Bersenbrück, Germany. Bilal,13, from Syria, is a self-described geek. He wants to study and learn English and German, but he needs new books and wants to reach Germany as soon as possible to go to school and learn more about the world. 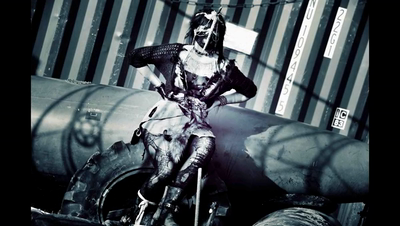 He sits on an abandoned car while translating verbs from Arabic to English. This collection of photos documents daily life in the Idomeni camp where refugees live in limbo on the border between Greece and Macedonia. 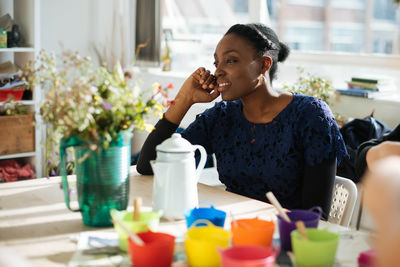 Some refugees who were photographed are identified by an initial because they did not want their names used. R., 32, from Syria kisses her nephew. 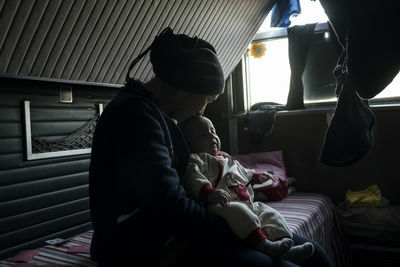 They live in an abandoned train at Idomeni railway station in Greece, at the border with Macedonia. 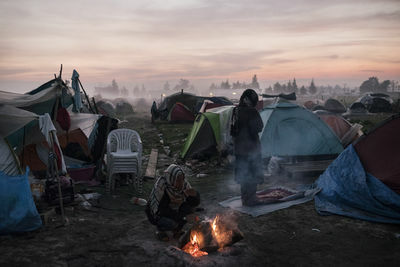 Some 12,000 refugees live in small tents and the ruins of an old railway station in Idomeni. 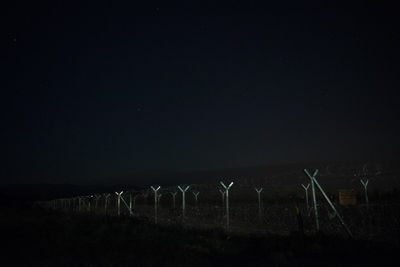 A night shot of the border fence between Greece and Macedonia at the Idomeni camp. 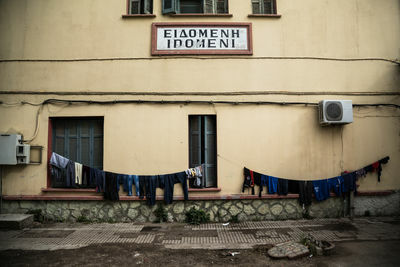 One of the buildings of Idomeni train station, in Greece, where some refugees have set up temporary homes while waiting to continue their travel to other European countries. 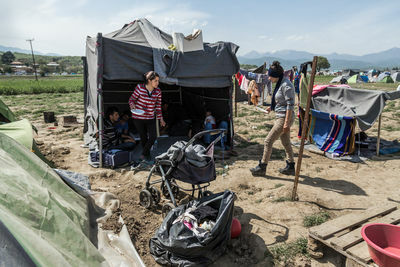 Thousands of refugees in Idomeni set their tents on railway tracks on the border with Macedonia where they have been for more than two months. 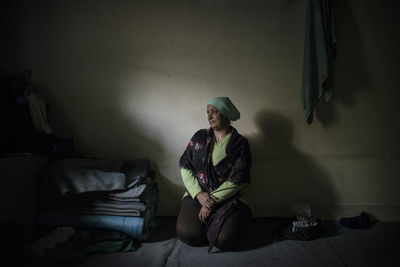 Raha, 41, from Syria, is in Idomeni with two sisters. She waits to reach her two sons, aged 15 and 20, who arrived in Germany months ago. Raha is still stuck here after two months. 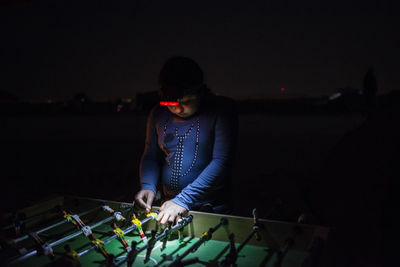 A Kurdish girl spends an evening playing with a recycled table football game at Idomeni refugee camp, a makeshift camp on the Greek-Macedonian border where thousands of refugees are stranded. Yazidis families cook food on an outdoor fire at the Idomeni refugee camp in Greece.. 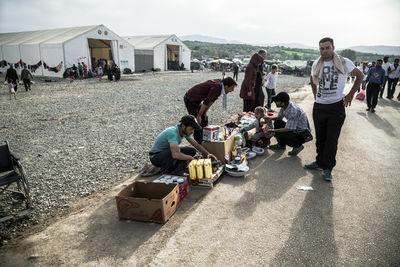 Refugees sell food and other items at the side of the entrance road to the camp in Idomeni, Greece. Yazidis are a religious group of about half a million people native to the northern Iraqi province of Nineveh. They share the same language and much of the culture of the Kurds of Turkey and Syria. As adherents of pre-Islamic Gnostic teachings they have been subjected to years of strong repression. In the last two years they have been one of the main targets of ethnic cleansing by ISIS militiamen, along with Christians and Shiites. In early August 2014 thousands of Yazidis fled towards the mountains of Sinjar as ISIS launched an offensive in northern Iraq. ISIS forces massacred over 5000 Yazidi men and kidnapped thousands of women who were sold into slavery in Mosul and Raqqa, Syria. Those who survived the attacks were trapped on the mountains of Sinjar without food, water or medical care, facing starvation, dehydration and the risk of further attacks by ISIS for several weeks. Fortunately PKK and YPG Kurdish forces opened a corridor from the mountains to Rojava ( Northern Syria, led by kurdish forces ) allowing them to flee to safety. Thousands of Yazidis took refuge in Rojava or in Kurdish areas in Turkey. Like the many refugees fleeing war zones, thousands of Yazidis try to escape to safer zones in Europe, where their tragedy continues. 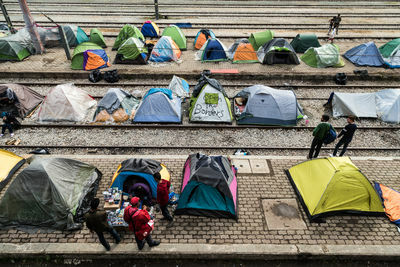 Stopped at the gates of Europe, they end up in refugee camps like the notorious Idomeni, between Greece and Macedonia. 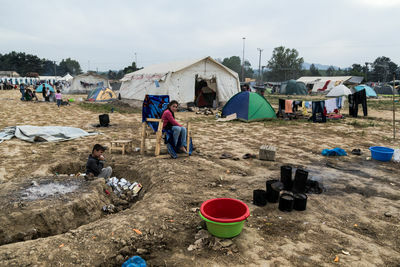 Here in makeshift tents on the Skopje railway line they are surrounded by waste, toxic fumes and mud. 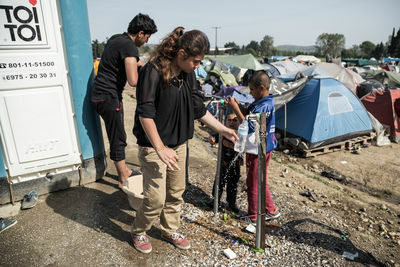 There are still over 1200 Yazidis who have been stuck for over a month waiting for the reopening of the border, closed at the beginning of March by Macedonian authorities with the silent approval of Europe; the same Europe that at the time of Yazidi's flight to the Sinjar mountains was crying for them, and which now closes its eyes to them. 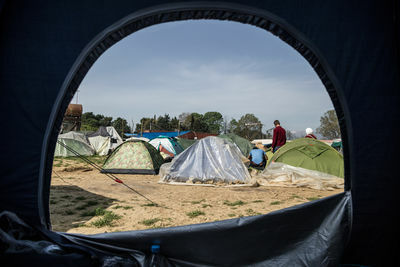 Looking out from inside a tent of a refugee on the Yazidi majority side of the Idomeni camp. 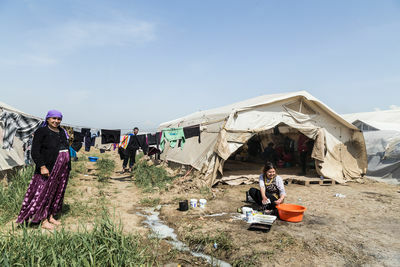 A Yazidi woman washes dishes outdoors. 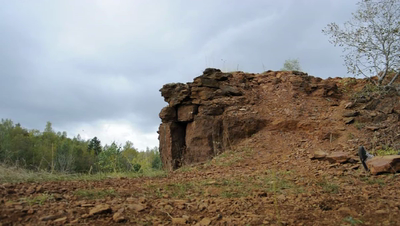 Behind her a large tent where more than 10 people live. A Yazidi man with his grandson in front of the tent where they have been living for more than one months. 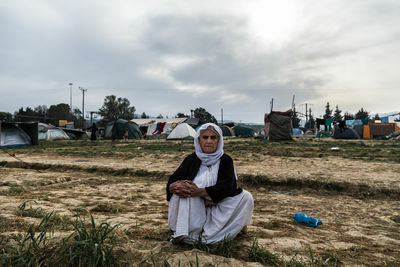 An elder Yazidi woman in the refugee camp in Idomeni, Greece. A Yazidi girl and her younger brother near the tent where they live in Idomeni, Greece. 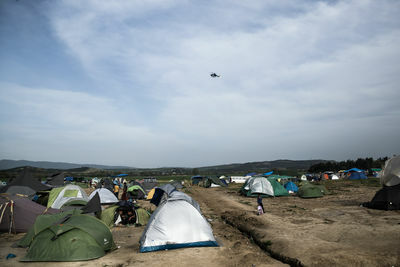 A Greek police helicopter flies over the refugee camp on a spring afternoon in Idomeni, Greece. 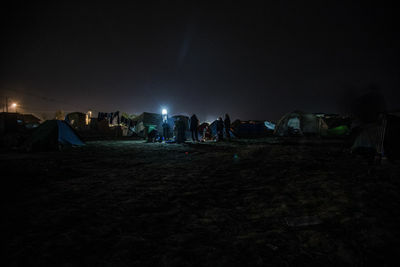 Yazidi refugees try to fix an outdoor lamp in a dark area of the camp in Idomeni, Greece. 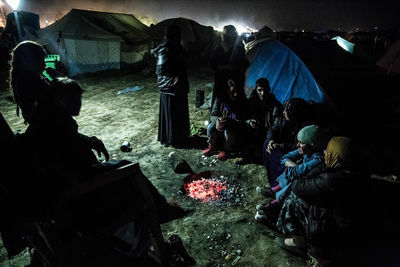 Yazidi families gather around the glowing embers of a campfire for warmth on a cold night in Idomeni, Greece. 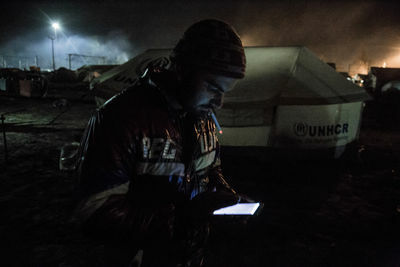 Salim, a young Yazidi refugee who has been living alone in the Idomeni camp, in Greece, for more than a month. 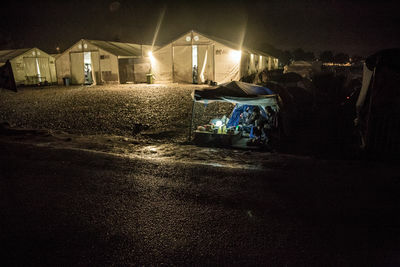 A night view of a part of the refugee camp near the Idomeni train station in Greece. A Yazidi man shaves in the early morning between hanging lines of clothing in a refugee camp in Idomeni, Greece. 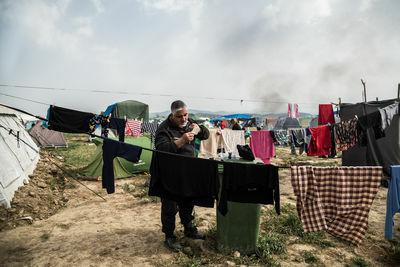 Refugees in the camp in Idomeni, Greece, hang clothes to dry on the fence built by Macedonia's authorities along all the border with Greece in order to stop the flow of refugees into the country. Yazidis fill bottles with drinking water on a very hot day at the refugee camp at Idomeni, Greece. 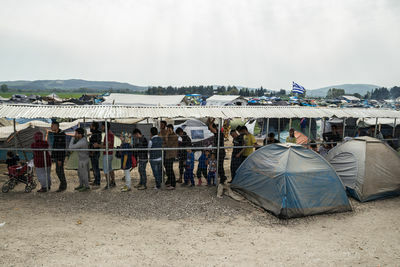 Yazidi refugees gather in a tent for a meal at the Idomeni camp in Greece. A long line of refugees waiting for the daily delivery of supplies by NGOs that are active in the refugee camp in Idomeni, Greece. 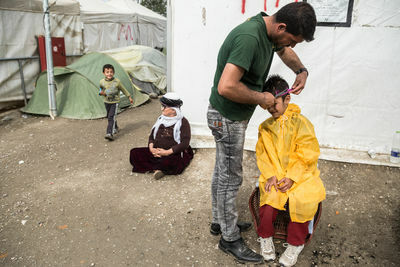 A Yazidi boy has his hair cut by a barber in the refugee camp in Idomeni, Greece. 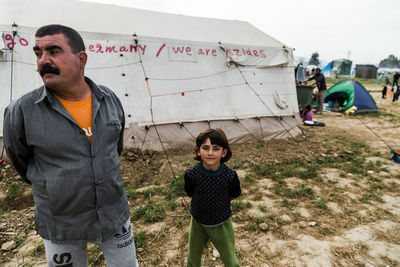 Behind them, an 84 year old woman sits by the tent where she lives alone in the camp. A Yazidi man sleeps on a cot inside a tent belonging to Doctors Without Borders. The majority of people in the Idomeni camp are Kurds. 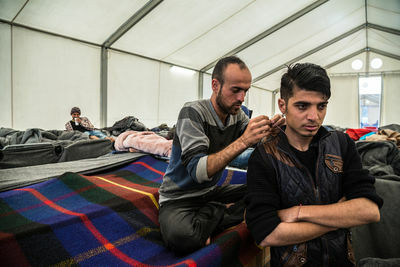 A Yazidi man fixes another refugee's necklace inside the large tent where they have been living for more than a month in the camp in Idomeni, Greece. 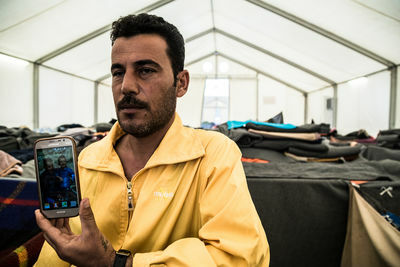 A Yazidi man shows the picture of his 4 year-old son who was killed by ISIS militamen in 2014 in Şinjar, in northern Iraq. 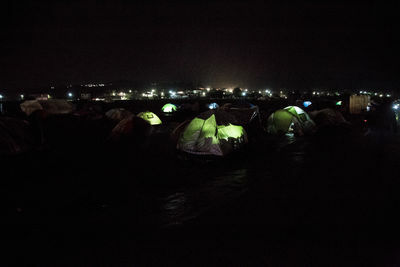 A rainy night at the Idomeni refugee camp in Greece where hundreds of Yazidi Kurds have been taking shelter for more than a month. 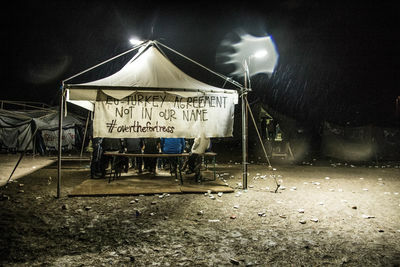 A banner denouncing the EU-Turkey agreement on refugees hangs outside a meeting tent on a rainy night at the Idomeni refugee camp in Greece. 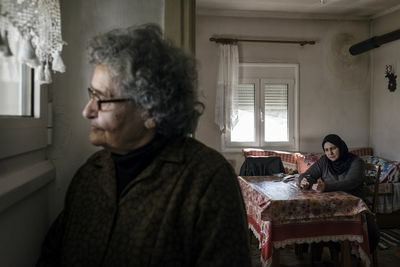 Panagiota Vasileiadou, also called "the Idomeni refugees' grandmother" is a 82 year-old Greek woman who houses five Syrian refugees in her home.